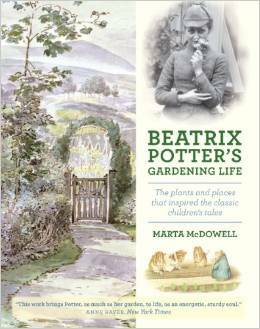 Marta McDowell’s biography focuses on Beatrix Potter, gardener, though Potter is probably best known as the author of The Tale of Peter Rabbit and many other beloved children’s books. From childhood, Potter was inspired by the city gardens of London and the country gardens of Scotland, where her well-to-do family spent their summers. McDowell, who teaches landscape history and horticulture at the New York Botanical Garden, recounts Potter’s decision as a young single woman to forsake city life and to buy one property after another in the English countryside, where she established gardens, orchards, and crop fields while preserving open space as well. Potter’s gardening enthusiasms and philosophy are shared through excerpts from her letters to gardener friends. Marrying in middle age, Potter and her husband eventually left all of their properties to the National Trust. The book is beautifully illustrated--including a season-by-season look at Potter’s garden at Hill Top, Near Sawry, in the Lake District of England--with period and recent photographs, illustrations from Potter’s children’s books, and drawings and paintings done by Potter throughout her life. McDowell’s meticulous research is apparent in the appendices, which chronicle each plant mentioned in Potter’s books and every plant known to have been planted by Potter at Hill Top. An active member of The Beatrix Potter Society, McDowell also includes a chapter for those who might be interested in a Potter gardening pilgrimage, noting which of her homes and properties are currently privately held, those that are open to the public, and those available for a stroll. Marta McDowell is also the author of Emily Dickinson’s Gardens: A Celebration of a Poet and Gardener, published in 2005.